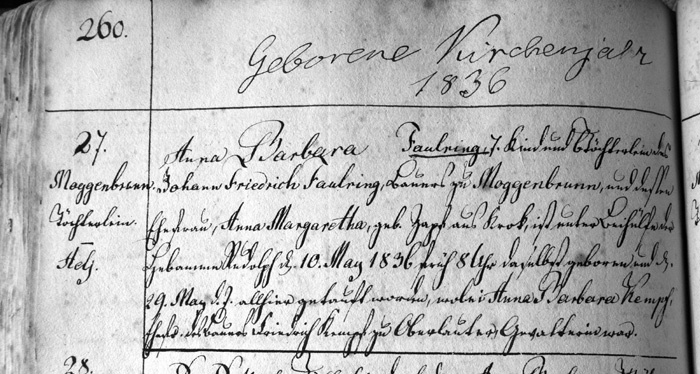 Anna Barbara Faulring was born in Moggenbrunn, Saxony Coburg Coburg-Gotha on May 10, 18361, the daughter of Johann Friedrich Faulring and Anna Margaretha Zapf and was baptized in the Church and Meeder on May 29th1. She received her early upbringing there and undoubtedly worked with her mother on the family farm. In October of 18535, Barbara left Moggenbrunn with her parents and emigrated to America. After a 51 day voyage, they arrived in New York on January 9, 18546. About 1858 Barbara married John Ehman, the son of Jacob Frederick Ehman and Augusta Hauffman51. 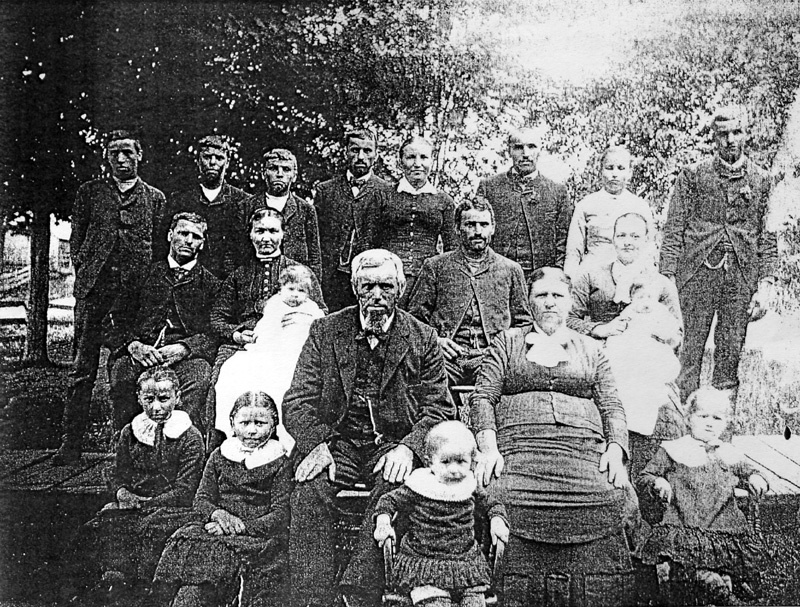 The Ehman family immigrated from Württemberg in the early 1850's. As part of the German American community which settled in southern Erie County and Cattaraugus County, New York, Barbara and John probably meet at social events and market days. Prior to their marriage, John had worked as a lumberman. Subsequently, he took up farming and they settled first in Ashford and eventually in Ellicottville, both in Cattaraugus County, New York. Between 1858 and 1876, Barbara and John had eleven children. Barbara died March 24, 188152, and is buried in Mt. Hope Cemetery, West Valley, New York. Following Barbara's death, John remarried to Dorothea Angermueller, with whom he had 6 more children. John died December 18, 189652, and is also buried in Mt. Hope Cemetery, Ashford, New York. i. Andrew Ehman Andrew was born June 2, 185952, and he died March 12, 193552. Andrew married Caroline Brown. ii. John Stanley Ehman John was born January 19 186151, and he died December 25, 192950. John married Ida Barbara Rohrich. iii. Frederick J. Ehman Frederick was born May 17, 186252, and he died August 31, 194052. Frederick married Martha Elizabeth Truby. iv. Casper Chauncy Ehman Casper was April 19, 186352, and he died February 23, 193952. Casper married Caroline Louise Rohrich. v. Christian Ehman Christian was born September 20, 186452, and he died November 12, 194052. Christian married Caroline Angermueller. vi. Charles B. Ehman Charles was born November 17, 186652, and he died December 29, 192152.
vii. Louis Ehman Louis was born March 4, 186751, and he died January 31, 192950. Louis married Flora Pfarner. viii. Edward Ehman Edward was born December 25, 187052, and he died September 1, 194352. He married (1) Mary Elizabeth Brunell, and (2) Clara Magdalena Klein. ix. Mary Barbara Ehman Mary was born April 10, 187151, and she died September 21, 194150. Barbara married John Derx. x. Louise M. Ehman Louise was born November 28, 187350, and she died September 17, 193710. Louise married Edward A. Pfarner. xi. Augusta Mary Ehman Augusta was born October 28, 187651, and she died April 4, 196050. Augusta married Wesley C. Willis.